The St. Louis Blues head to Barclays Center to take on the New York Islanders on Monday, October 9, 2017. The opening line for this contest has the Blues at -102 and the Islanders at -120. St. Louis had a record of 46-29-7 last year and away from home they had a record of 22-17-2. They were 3rd in the Central Division. They tallied 235 goals and surrendered 218 goals for a point differential of +17. For the year they had an ATS mark of 52-41-0 and an over/under record of 37-43-0. New York finished with a record of 41-29-12 including 22-12-7 on home ice last year. They were 5th in the Metropolitan Division. They scored 241 goals and gave up 242 for a goal differential of -1. Their record against the spread was 41-41-0 while their over/under mark was 42-37-0. Brayden Schenn scored 54 total points last year for the Blues. He had 25 goals last season with 174 shots on net giving him a shooting percentage of 14%. He had a total of 29 assists on the year and averaged 17.9 minutes played per contest. Vladimir Tarasenko averaged 18.5 minutes of ice time per game last season. In that time he had a shooting percentage of 14% by tallying 38 goals on 275 attempts. He had 34 assists giving him a total of 72 points on the year. Jake Allen had 33 wins and 20 losses last season in goal for the Blues. He had 1,620 shots against him and he surrendered 138 goals. He made 1,482 stops for a save percentage of 92%. Jordan Eberle had 47 total points last season for the Islanders. He had 16 goals last year with 198 shots on goal giving him a shooting percentage of 8%. He had a total of 31 assists on the year and averaged 16.8 minutes played per contest. 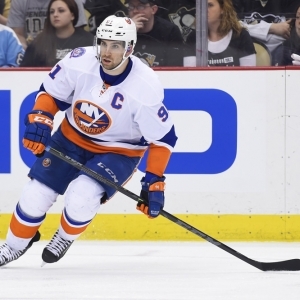 John Tavares averaged 20.4 minutes of ice time per contest. In that time he had a shooting percentage of 11% by scoring 28 goals on 260 attempts. He had 38 assists giving him a total of 66 points on the year. Jaroslav Halak had 12 wins and 9 losses last season in net for the Islanders. He had 885 shots against him and he gave up 75 goals. He made 810 saves for a save percentage of 92%. The Blues had 99 total points last year, which was 11th in the NHL. They scored 235 goals while giving up 218 scores, which had them ranked 12th and 19th respectively. They had 235 power play chances and scored 50 goals on those opportunities for a percentage of 21%. That was 8th in the league. The Blues gave up 263 power play opportunities and surrendered 40 goals on those chances for a penalty kill percentage of 85%, ranking them 3rd when short-handed. They averaged 28 shots per contest and as a team shot 10.09% for the year. They allowed 28 shot attempts to their opposition per game and had a team save percentage of 91%, which was 20th in the league. The Islanders were 17th in the league with a total of 94 points last season. They had 35 power play goals on 234 chances for a percentage of 15%. That was 28th in the NHL. They gave up 227 power play opportunities and surrendered 40 goals on those chances for a penalty kill percentage of 82%, ranking 11th overall. As a team, the Islanders were 10th with a total of 241 goals scored while they gave up 242 goals last season, ranking 8th in goals against. They averaged 30 shots per game and had a team shooting percentage of 9.72%. As a unit they gave up 32 shots per contest and had a save percentage of 91%, putting them 17th overall in the NHL. The Blues started possessions in the offensive zone 48.8% of the time while their defensive zone percentage was at 51.2% for the year. That ranked them 27th and 10th respectively in the NHL. They had 2,438 face-off wins as opposed to 2,411 losses, meaning their face-off win percentage was 50.3%. That was 15th in the league. On defense St. Louis had 1,688 hits and they blocked 1,135 attempts from opposing offenses, ranking them 17th in blocked shots. St. Louis was ranked 19th in Corsi percentage with 49.5% as they tried 4,271 shots on goal while at full strength while they surrendered 4,364 shots on net when they had a full team on the ice. Their Fenwick percentage was 19th in the NHL at 49.8%, as they had 3,207 shots while they gave up 3,229 attempts on defense. New York was 25th in the NHL in Corsi percentage last year with 47.5%, as they attempted 4,574 shots on net at full strength while they gave up 5,049 shots on net in the same situations. Their Fenwick percentage was 47.9% as they had 3,395 attempts while they gave up 3,686 shots on the defensive end. That ranked them 26th in the league. The Islanders started possessions in the offensive zone 50.2% of the time, which was 17th in the league, while their defensive zone percentage was at 49.8% for the season. That was 12th overall in the NHL. They had 2,261 face-off wins compared to 2,480 losses, meaning their face-off win percentage was 47.7%. That ranked them 25th in the league. On defense New York had 2,126 hits and they blocked 1,363 shots from the opposition, putting them 1st overall. Who will win tonight's Blues/Islanders NHL game against the spread?